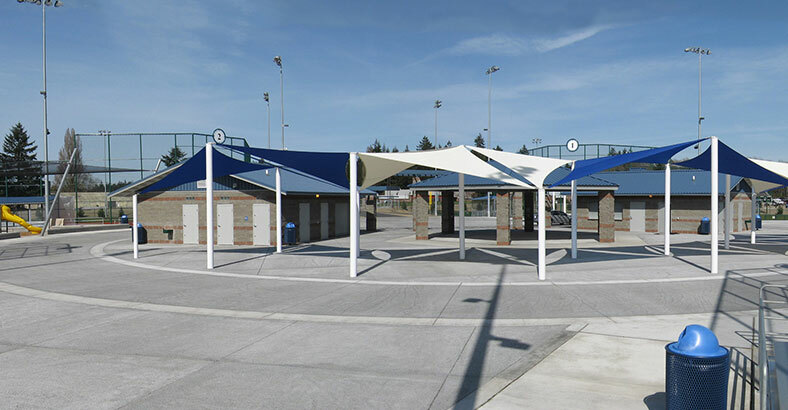 The project was developed jointly by the City of Lacey and Thurston County, designed by our firm and constructed by Ceccanti, Inc. With its second phase reaching completion just last year, the award winning complex has filled a major void in the recreational needs of the community. A central element in the design of the RAC was a focus on maintenance. To help achieve this, maintenance personnel played an active role in the design. 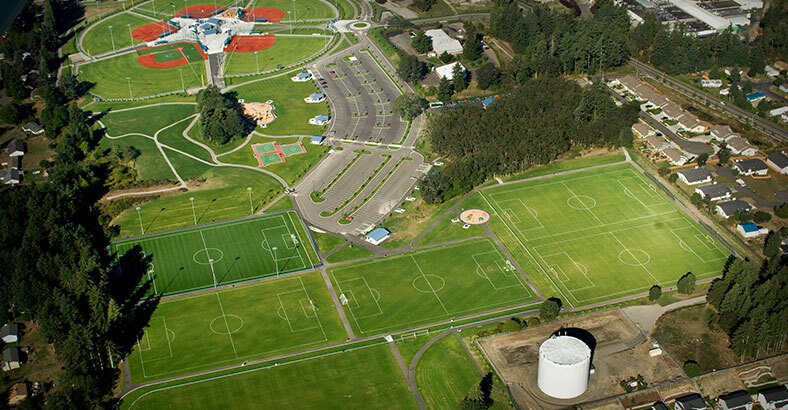 Due to the intensive use of existing facilities, there was significant pressure during the planning phase of this project to maximize the number of athletic fields and facilities on the site, while at the same time providing a family oriented park that would meet the needs of the local community. The west area of the site incorporates the batting fields complex with its own concession, restroom, and play area at the heart of the pinwheel of five ball fields. The central portion of the site includes open spaces, play areas, picnic shelters, and natural areas for family oriented activities. Finally, the eastern portion of the site is a vast, terraced open lawn area, primarily intended for soccer (one synthetic and five grass fields) or football, but capable of sustaining a grass volleyball tournament or community festival events. 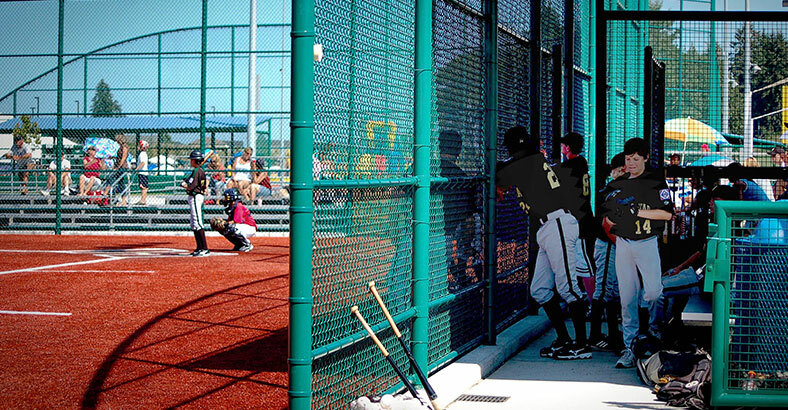 The 100-acre complex features six regulation soccer fields, including one with all-weather turf and lighting: four regulation softball fields with synthetic turf infields and lighting; one minor-league-rated baseball field with synthetic turf infield and lighting; electronic score boards; two concession buildings; five large group picnic shelters; spectator seating; parking for 500 vehicles; three playgrounds; two miles of walking and jogging paths; a kite-flying hill; three half-basketball courts; and a six-acre outdoor event and festival area. In addition, nearly 20 acres have been preserved to protect native oak savannahs. The design features the preservation of the White Oak Woodlands in the north central portion of the site. The 36,000 sf of pervious concrete allows direct infiltration of rainfall on-site through the ball field plaza. Storm water from the entire 70-acre site is infiltrated via infiltration trenches below the fields. Parking lot runoff is treated and infiltrated. Pre-design geotechnical studies were used to influence layout of activities and support facilities. Areas with high infiltration rates became locations for the athletic fields, while less intensive uses were placed on areas of lower permeability. The majority of the two miles of trails are pervious asphalt, and the pervious concrete ball field complex plaza allows infiltration directly under it. As a result, the cost of expensive storm water facilities for collection and conveyance is avoided. With direct infiltration of the fields and pervious paving, storm water infiltration pond size was minimized while active recreation space was maximized. The intent to “waste nothing” became the spirit of the RAC project. Strippings from all graded areas were screened and recycled for topsoil. Tailings from the screenings were then used to shape the west side of “Kite Hill”, a natural feature of the site. To accommodate the massive earthwork, two of the six fields that lay on a naturally raised elevation were used as a dynamic soil reservoir for balancing cut and fill and as borrow after discoveries of unsuitable soil left behind by the previous land owner. As excavation revealed buried deposits of unsuitable soil, the material was removed and used as non-structural fill to enhance the shape of “Kite Hill” and the two field areas provided structural replacement fill. By recycling material on site, economic and ecologic savings were realized through eliminating the need for exporting or importing soil, thus reducing fossil fuel consumption as well. Ease of maintenance of the natural grass areas was considered as well. For grass fields and passive-use locations, the majority are accessible by gang mowers with mow strips provided adjacent to fences and structures. Furthermore, preserving the native white oak savannahs and their under story was a key design precept and avoided potential maintenance. Maintenance is supported by a 2,100SF maintenance building with shop, storage, office, restroom, and lunch room for staff. Equipment wash-down and material storage are contained within the 20,000SF fenced yard. The park manager and support staff are adjacent in the 1,630SF events building, which includes a reception area, staff offices and meeting rooms. 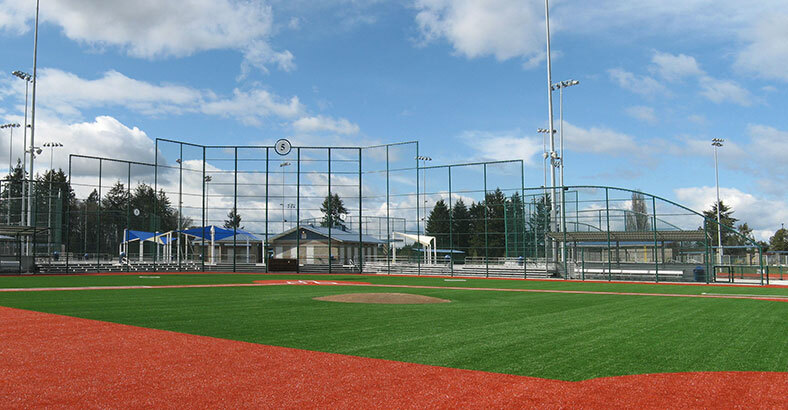 All these cost saving features enhance the overall design and the park is recognized as one of the finest athletic complexes in Washington. 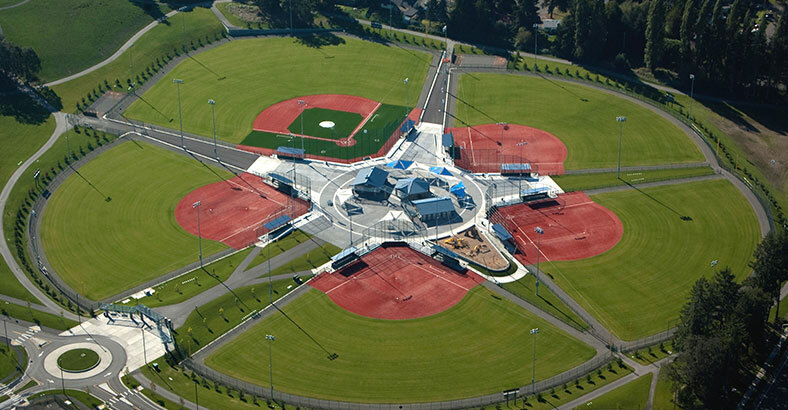 The park received the 2009 Washington Recreation & Park Association’s Best Sports Complex Award, the 2010 International Northwest Park and Recreation Association Design of the Year, and the Washington Concrete & Aggregates 2010 Pervious Concrete Design Award. “This is a tremendous facility and a great place to bring the family,” remarks Lacey resident Jay Rasmusson, “Before this our options were quite limited. The RAC is an amazing addition to our community”. 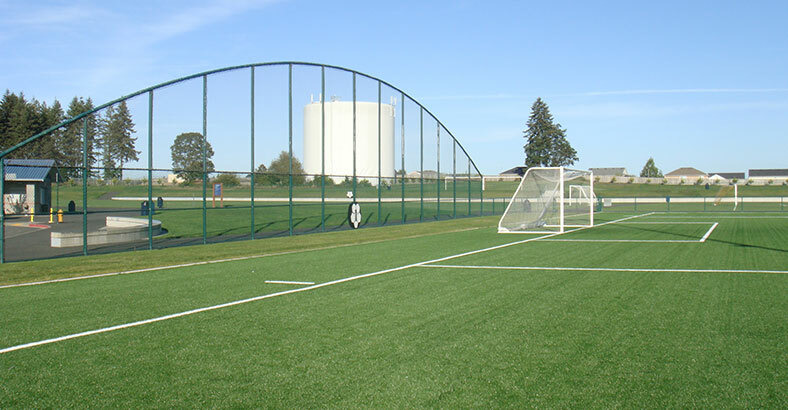 All infields and one of the soccer fields were constructed with synthetic turf to extend use throughout the year, virtually eliminating rainouts and maximizing field rental revenue. Since no watering or mowing is required and no infield prep necessary before each ball game, daily operational costs are kept to a minimum. Minimizing water and power use was carefully considered. Irrigation master valves help avoid water loss by shutting down the system in the event of leaks. All lines are the requisite purple pipe to allow the use of reclaimed water from a future sewage treatment plant north of the park. Floodlighting of all the ball fields is state-of-the-art 1,500 watt shielded metal Halide luminaries with reduced reflecting surfaces to reduce off-site light spill. Discussions for designing an additional 20-acre Phase III are in progress.